I heartily recommend, without hesitation, The Dog Who Healed a Family (And Other True Animal Stories That Warm the Heart and Touch the Soul). This is easily one of my favorite books that I’ve read in recent years. Wow. On page 4 — page four — I was bawling. Not because the story of The Puppy Express was sad or tragic (as it is precisely the opposite)…because it was so uplifting, so sweet, so remarkable. I was crying tears of joy and could not stop. Seriously. Then there’s the story of the fawn that was born when his mother was hit by a car…and was taken in by the staff and residents of a nearby nursing home, who cared for him and fed him until he was a year old. Then, when he broke (shattered, actually) his leg and a staff member found him in the woods, they rallied around him to get him the life-saving surgery he needed and nursed him back to health. Move on to the next story, about a young woman with a cat who is surprised with an unexpected — and, at first, unwanted — bunny. Imagine dear, sweet, troublemaking Elizabeth, with one floppy ear that hangs in front of her eye…as she romps with Robert, the cat, or uses the balcony flower boxes as a litter box, or as she systematically destroys so much. And yet Jane cannot let go of Elizabeth, who has become such an important part of her life, and of Robert’s. Jo Coudert has compiled a collection of the most charming, endearing, heart-warming (and heart-wrenching) stories about animals and the people who love them. Or is it about people and the animals that love them? Well, actually, it’s both. Let me tell you, any pet owner or animal lover will quickly fall head over heels for this book. This is at the TOP of my list for gift ideas from here on out. 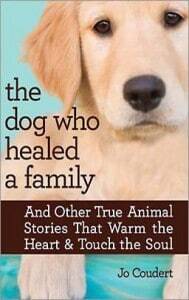 Hurry to the bookstore for your own copy of The Dog Who Healed a Family. You’ll be laughing and crying from beginning to end…how many books can you say that about?